For over a century, Days Corp has provided services to manufacturing companies across Indiana. From the days of horse-drawn buggies, Days has worked alongside the regional economic powerhouses. While the time of horse-drawn buggies has long passed, Days Corp has continued to grow as an influencer in several industries. Currently, there are 5 divisions and affiliates in the corporation. To represent the modern structure of the corporation, the Days Corp site has been designed utilizing a mobile responsive, multi-site system. 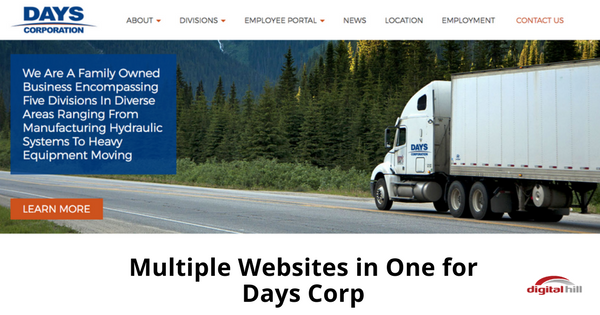 With 6 sites, the Days Corp website is designed to allow site visitors to go directly to the division they need. Not only does this coincide with the current company operations, this allows for tighter organization. The ability to host multiple websites on a single domain, using shared design and branding, allows easier access to key parts of the organization. With a WordPress Multi-site backend, site management is easily handled with one master administration login area. The main site provides access to the other sites while serving as the main hub for information on Days Corp. From the navigation and footer bars, one can access news, get access to affiliate sites, corporation history, and contact information. As a supply chain partner, Days Distribution and Logistics offers warehousing and transportation services. This site features a photos gallery and access to the customer portal. For 3 decades, Days Export Packing has been providing manufacturers with the latest in packing technology. Therefore, this site is designed to highlight the innovative techniques of the packing division of Days. Days Corp affiliate, Equalizer Systems provides hydraulic services across the industry as well as installations. Powered by an eCommerce system, customers can buy leveling systems and trailer jacks for their vehicles in the online store. The WordPress multi-site structure of the Days Corp site lends itself perfectly to the representation of the operations under the Days umbrella. The interconnections between each site make it simple to navigate between sites. For site admins, managing a WordPress multi-site system makes it easier to manage content and maintain support across all sites. There’s no need to use multiple logins to access individual sites. Instead, one can login to a single content management system. As a result, the Days Corp’s multi-site system allows them to highlight their individual divisions and reach new customers in the modern age while being easy to maintain and update. Have multiple brands or companies and want to manage them easily all in one place? Contact Digital Hill to see if t a WordPress Multi-site system is right for your company.